Are you fascinated by the healing and harmonic resonance of the Gong? Whether you are new to playing the gong or an experienced player, this workshop will offer a new perspective on how to work with this powerful sound current. Expand your relationship with the gong in a way that is transformative yet liberating, playful and creative. No prior experience playing the gong is necessary. Learn a number of gong strokes and playing techniques that will deepen your understanding and experience with the gong. Novices will get a solid base of playing techniques and deep listening exercises to help enter into an active state of meditation while playing. More experienced gong players will get an expanded vocabulary of sonic possibilities, subtleties and dynamics in producing various sounds, textures and tone qualities. We will also focus on playing the gong in different settings – individual therapy, group experience and Savasana. We will have a large selection of gongs to practice with during the workshop. Participants are welcome to bring their own gong(s) to practice with as well. If you plan on bringing a gong, please arrive 15-30 min early to set up your gong and stand. Open to all! No prior experience playing the gong or ownership of a gong necessary! Space is limited to 16 participants. Advance registration strongly advised! A $50 cancellation fee will be subtracted from the 100% refund if notification is received less than 1 month and more than 10 days in advance. Cancellation fee will be waived if you find a replacement for your spot. No refund is available if notification is received less than 10 days prior to the training. Crown Of Eternity spend their lives serving people through vibration, sound, music, and energy healing. Through their extensive international tours with workshops, trainings, therapy sessions, concerts and retreats they have helped thousands of people connect to their life energy, to deeper relaxation and to self healing. They have performed at Sat Nam Fest, Bhakti Fest, the Kripalu Center, and hundreds of yoga studios and wellness centers throughout North America. They have trained many budding sound therapists on the therapeutic aspects of the Gong. Over the past 20+ years Mike Tamburo has become well known as a multi-instrumentalist and polymath, performing and recording ecstatic and transcendental music as well as folk, ambient and sometimes unclassifiable sounds. He is also an artist and a film maker. As he worked deeper and deeper with the sound current and his own self healing practices, he discovered the healing power of the gong and other tuned metal instruments (singing bowls, bells, sound plates) as well as the healing power of mantra and toning. In 2008 he met Gallina Tamburo, who was on her own journey of healing. Their shared love of ecstatic music, kundalini yoga, the gong, sound therapy, and sacred chanting set the foundation of their relationship, marriage and eventual musical collaboration. In addition to completing their Kundalini Teacher Training at the mother ashram in Espanola, NM and Yoga For Youth Training with Krishna Kaur they have studied with Gongmasters Don Conreaux and Sotantar. They are also trained in the Peter Hess Method of Sound Massage using Himalayan Singing Bowls for healing. They have also studied with John Beaulieu in his Body Harmonics approach of sound healing with tuning forks. The duo have released 6 CDs together and also run the Sounds Eternal record label that has released many of Mike’s solo recordings. Together, Mike and Gallina have developed their own style of relating to the therapeutic vibrations of the Gong, incorporating ancient wisdom and infusing it with creativity, playfulness and joy. Crown of Eternity offer a unique sonic experience that is as much grounded in tradition as it is groundbreaking. There is an expansive, blissful, ethereal and epic quality to Crown of Eternity’s music. They are truly immersed in vibration. Their CDs include Gong/Bell CDs: “Dream Architecture”, “Earth in Space” and Mantra CDs: “When the Music’s On”, “Vibrate the Cosmos” and “The Cosmos Shall Clear The Path” and Mike’s newest hammered dulcimer release “The Way To Be Free’. 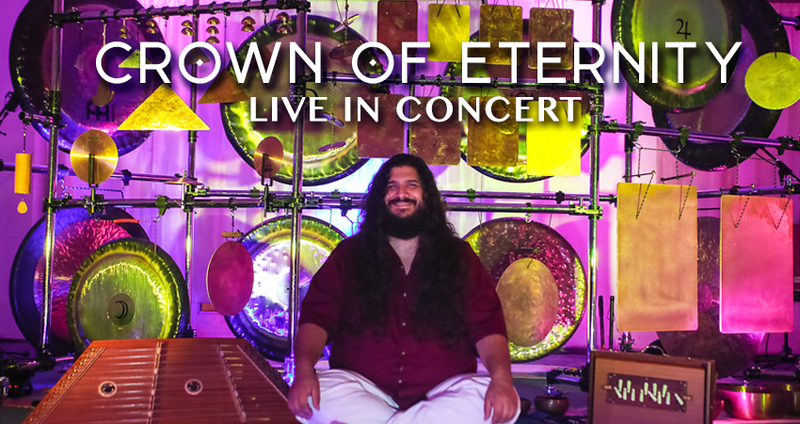 Whether they are bathing you in the complex harmonics of multiple gongs, ecstatic instrumentals or their cosmic renditions of sacred Kundalini Yoga mantras, Crown of Eternity delivers a heart centered experience that you will deeply appreciate and remember.